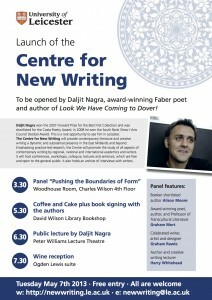 The Centre for New Writing at Leicester Uni is being launched next week. This is a new venture that aims to promote new and interesting writing in the region and beyond. 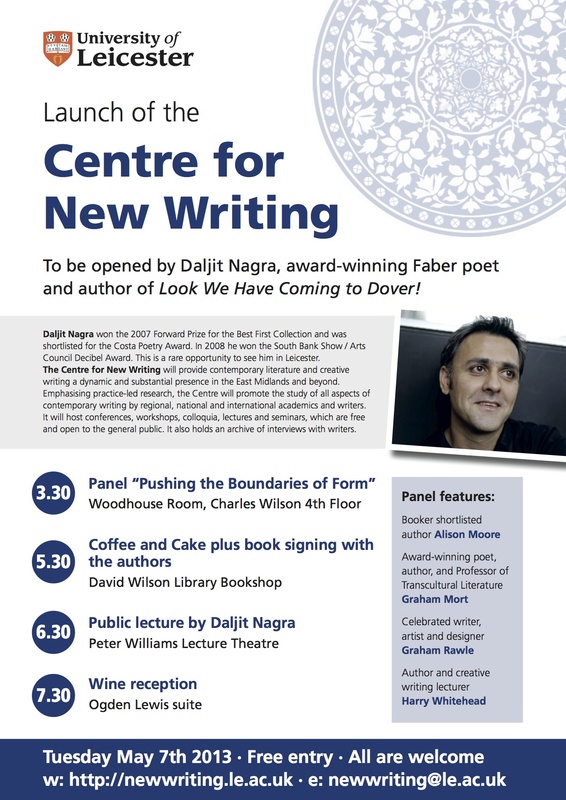 The launch event is going to be a day of fun, panels, cake, conversation and wait for it… drum roll please…Daljit Nagra. Check out the poster below for more details. All welcome so if you’re in Leicester come along. As an added incentive…if all goes well I should be reading a few of my poems at the wine reception afterwards…now if that doesn’t have you rushing to the lecture theatre I don’t know what will! The Centre is going to be running all sort of lectures and masterclasses in its aim to promote creative writing. Today (pre launch I know!!) we’re being treated to both Ben Okri and John Siddique. Exciting times to be a poet at Leicester Uni! This entry was posted Tuesday, April 30th, 2013 at 3:13 pm	and is filed under Writing and Art, Writing groups. You can leave a response, or trackback from your own site.